It seems like just yesterday we were being introduced to this season's wannabe "Voice" contestants during the blind-audition rounds, and now we've nearly reached the finale of the singing competition's third season. Only one contestant was sent home Tuesday (December 11) after Monday's "musically perfect" performance episode, which left three contestants to battle it out in one more live performance round before the winner is announced. 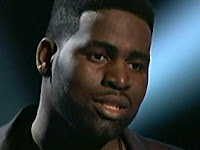 Sweet-as-pie, teddy-bear crooner Trevin Hunte from Team Cee Lo was sent packing, leaving Nicholas David, Terry McDermott and Cassadee Pope in the competition. "Thank you for pushing me, motivating me," Hunte said to his coach, expressing gratitude for how he learned to stretch and explore his vocal abilities. "I love you, Cee Lo. I will always love you. I'm just happy to be here." Moments before the names were announced, coach Cee Lo expressed his sadness over having to lose one of these two loveable men, as Hunte and David were the bottom two. "I hate seeing you two pitted against each other," he said. "You have my love respect and loyalty going forward. May the best man win." Speaking to the happy moments on the show, Team Blake finalists McDermott and Pope kicked off the evening's performances with a duet/cover of "Little Talks" by the Icelandic folk/Indie band Of Monsters and Men, who, as luck would have it, were actually in the house to watch the performance, which they enjoyed, judging by their enthusiastic applause after the fact. Tuesday's show was bursting with "Voice" alumni performances. Juliet Simms turned the show into a full-on rock concert with a theatrical, Joan Jett-esque performance of her single "Wild Child." The onetime Team Cee Lo member, who is still being managed by her coach, told host Carson Daly she was happy to be back on the stage and advised the contestants to try and live in the moment and be proud that they've made it this far. Simms' showstopper was followed by blond country songbird RaeLynn, the former Team Blake member, who slowed things down a bit with her slightly saucy new single "Boyfriend." Finally, we were treated to the powerful pipes of former Team Christina member Chris Mann, who performed his power ballad "Roads." The final performance of the evening was from Team Cee Lo, Trevin Hunte and Nicholas David went somber and sentimental on the Mariah Carey classic "Hero."